It’s been 8 years since I started researching the origins of the Rockefeller Christmas Tree and this is the fifth year I’ve located it with aerial photos in online maps. Unfortunately this is the fuzziest online map view I’ve had in those years. I usually find a pretty nice photo of the tree in its original location, but this year’s tree, hailing from Mifflinville, Pennsylvania, hasn’t had a good photo op and so we must admire it instead in its decorated glory. 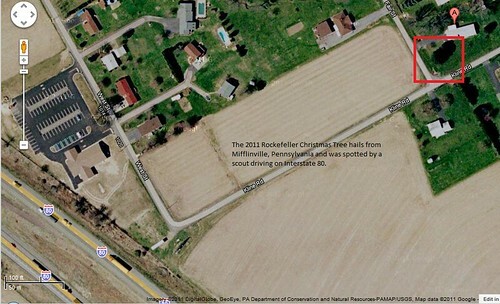 Instead I took a screenshot illustrating its proximity to Interstate 80 where a Rockefeller Christmas Tree scout, driving along, spotted it in March. The owner, Nancy Keller’s late husband had wanted to cut the tree down when they first moved there 30 years ago. Now Mrs. Keller gets to fulfill his old wish and also donate it to a very public and worthy cause. After the holiday season ends the Norway Spruce will be milled into lumber for Habitat for Humanity. I wish had an interesting John McCarthy story but mine is hum drum. 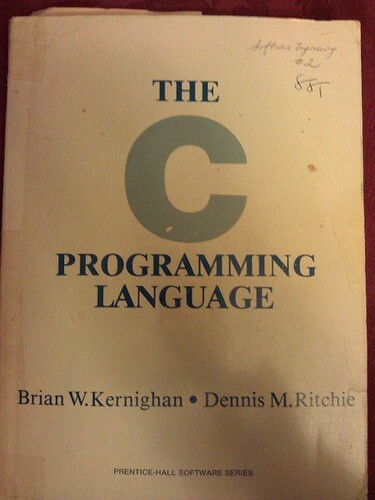 I was at a talk at MIT circa 1990. It was most likely about software patents but I don’t recall the topic exactly. Someone a few rows over stood up to ask a question (actually he made a statement, a good one) and a revered hush spread across the room as we collectively recognized the father of Lisp. He said his piece, sat down and that was that. Since I was actually a Cognitive Science major (who realized I only needed a few more courses for a resume-burnishing Computer Science major) the artificial intelligence topics were especially interesting. I spent a lot of time in LISP and Scheme during college and while I’ve never used them in my career, I’ve always strived for that elegance of expression. Pointers have been lumped with the goto statement as a marvelous way to create impossible-to-understand programs. This is certainly true when they are used carelessly, and it is easy to create pointers that point somewhere unexpected. With discipline, however, pointers can also be used to achieve clarity and simplicity. A sliding pole? A huge garage? What attracts buyers to old firehouses? It’s not just the romanticism. Firehouses often reflect the architecture of the time they were built and since the older, historic houses are the ones usually up for sale, the draw’s in their appearance and what can be done with the interesting space. Seattle has just granted approval for two old firehouses to go up for bid. Fire Station 38 was built in 1930, Fire Station 37 in 1925. Their assessed values may not be accurate for fair market value but they provide a ballpark price for the curious. Both are historical landmarks so alterations will have to go the city’s Landmark Preservation Board. Fire Station 37 suppposedly comes with a ghost upstairs which the firefighters won’t mind leaving behind when they move into their new modern station. Seattle’s Museum of Flight missed out on getting a space shuttle but their board hasn’t given up on trying. They’ve met with NASA to point out flaws in the data regarding tourist attendance numbers used to determine which cities would get one of the coveted, retired spacecraft. NASA is of course standing firm on its decision to place shuttles in Los Angeles and New York City, along with the obvious winners Washington D.C. and Kennedy Space Center in Florida. New York’s Intrepid Museum has already changed its plans for displaying the shuttle and may take a few years to raise the funds and build a suitable structure. The Seattle folks would love to take a shuttle even temporarily while permanent homes are built. The Museum of Flight is already spending $11.6 million on a new Space Gallery which was hoped to house a shuttle but will display a full-scale shuttle trainer instead. At the heart of the general store is the community. Tourists may come to see the New England fall foliage and stop in to buy a souvenir but these stores may also be the local post office, coffee and donuts gathering spot, soda fountain, penny candy store. As this A.P. article points out, one of them sells guns and wedding gowns. This Friday the Seattle Cinerama begins a two and a half week 70MM and Cinerama film festival. The theater’s curved and impressively wide Cinerama screen will be used for all showings. Greg Wood tracked down several 70MM classics including “2001: A Space Odyssey”, “Cleopatra”, and “My Fair Lady”. A few years ago at a similar event, I saw “This Is Cinerama” there with all 3 projectors going. “Lawrence of Arabia” in 70MM had just been delivered to the theater from Sony Pictures by FedEx and so I snapped a photo of the 13 large containers sitting in the lobby. The festival is a unique opportunity to truly see the widescreen movie experience as it was before theaters were crammed down into sizes that makes one want to just wait for home television viewing.